His name is Kiwi, my cutie and funny cat, 6 years old... 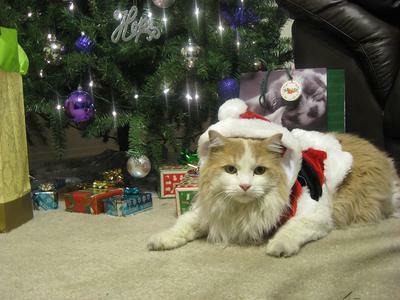 I love him... here with his santa suit... lol. What an adorable cat. I would love to see him under my tree! Kiwi is my name too. Kiwi is my cat's double! My cat's name is Whitey and he's 13 yrs old. We put a Santa Hat and a velvet bib edged w/rhinestones around his neck and put this photo on this years Xmas cards that I sent! What a sweet boy to pose under the tree! He looks so adorable!! What a little Christmas angel! Our cats just LOVE the Christmas trees, don't they? You have a beautiful cat! And he makes a great model! Beautiful cat with such a neat name. What a good baby to pose so nice. He is so cute, I love his name.